The eighteenth and early nineteenth centuries saw an evolution in shopping spurred by a faster turnover of manufactured "fashionable" goods and an increase in department stores selling them. These shops pioneered new techniques of window display. Rather than piling their stock up-as had been common in markets and bazaars-they sold goods in mannered and self-conscious window displays, intended to sell nonessential goods. In cities, where competition was strongest, stores had larger windows and more frequently changing displays. A visitor to London in 1786 wrote of "A cunning device for showing women's materials whether they are silks, chintzes, or muslins, they hang down in folds behind the fine high windows so that the effect of this and that material, as it would be in the ordinary folds of a woman's dress, can be studied" (Adburgham, p. 6). This comment suggests that there was an awareness of sophisticated marketing techniques and a developing vocabulary for display in the late eighteenth century, which would be developed but not improved upon by later generations. By the nineteenth century the small store with glass windows and some form of gas lighting dominated the main street. The arrival of department stores in the 1850s-multistoried buildings that utilized plate glass in long, uninterrupted window displays-would herald a new display aesthetic. Fashion goods began to be displayed in lifelike room settings, with mannequins. Known as "open displays," these windows relied on themes and narratives, rather than sheer quantity of goods, for visual impact. The window display was now contextualizing goods, giving them precise domestic or cultural settings and imparting qualities other than practicality and price. 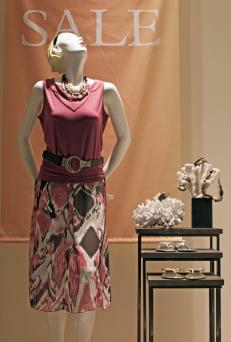 In these displays the fixtures, stands, and mannequins, came into their own. Unfashionable stock goods continued to be displayed as though they were on a market stall-piled high or stacked in rows in the windows in "massed displays." These open displays were developed first in America, where the professionalization of the display trade had begun in the late nineteenth century. The display technocrat L. Frank Baum (who would later write The Wizard of Oz) began the first journal aimed at the display trade- The Show Window in 1897-and founded the National Association of Window Trimmers in 1898, which did much to raise the status of window trimmer to that of display manager. America had a large number of colleges teaching commercial design based upon the work of pioneering consumer psychologist Walter Dill-Scott, author of Psychology of Advertising in 1908. His theories for appealing to hidden desires of customers using particular colors, images, and formations in advertising layouts were applied to window display though numerous handbooks and journals detailing the creation of the "selling shop window." This approach was brought over to England by Gordon Selfridge (a friend of L. Frank Baum) and his dis-play manager, Ernst Goldsman. Both men had worked at Marshall Fields department store in Chicago in the 1890s, where Selfridge had introduced radical and innovative methods of display and marketing, starting the first window displays and display department. Selfridge's department store in London opened in 1909 with the longest window facade ever seen in Britain. The store achieved instant fame for its window displays: "They gaped in amazement at the American-style window-dressing with its life-like scenes and with wax models arranged in realistic poses" (Honeycombe p. 205). Goldsman was integral to the professionalization of the British display trade, founding the National Association of British Display Men in 1919. Such display organizations disseminated new ideas via lectures, display fairs, and their journals. In Germany the design reform theories taught at the Deutsche Werkbund and later the Reimann School, in the first decades of the twentieth century, led to a new style of Modernist window display. The objects and fixtures were reduced to a bare minimum and arranged on strong geometric lines. These Modernist display ideals were disseminated when many window display managers left Germany for political reasons in the first decades of the twentieth century. The Émigré designer Frederick Kiesler, for instance, was a Romanian architect, designer, and member of the De Stijl group who went to America in 1926. By 1928 he was working designing Modernist window displays at Saks and authoring the influential book Contemporary Art Applied to the Store and Its Display in 1929. The photographer Eugène Atget had been documenting Parisian shop windows since the 1890s, and these images had been influential for succeeding generations of artists, particularly the Surrealists. Mass cultures, including window display, had become subject matter for artists such as Léger, Max Ernst, and Salvador Dali. Both Kiesler and Dali used the window itself as a frame in their commercial display work and in England commercial designers like Misha Black, Edward McKnight Kauffer, and Tom Eckersley also worked in display. The extreme modernist displays would, for the most part, be confined to small designer boutiques. The rest of the retail industry was looking toward America and the film industry for inspiration. There was an obvious corollary between the brightly lit shop window display and the cinema screen and the new and "showy" style of window display developed in America. In the 1930s these displays drew on contained visual references from films and advertising to create windows that looked like stills from films: brightly lit, full of oversized props, shiny fixtures, and film-star-like mannequins. Film and magazine promotional "tie-in" displays became popular. Sometimes the shops were selling fashions copied from the film, but often these displays would only loosely link the goods in the window with the film, hoping that the merchandise would sell if it were associated with the glamour of Hollywood. Advertising display agencies, which (on both sides of the Atlantic) mass-produced display campaigns for branded goods, were particularly well placed to take advantage of the mass appeal of film tie-ins. World War II halted the progress of window display in Europe. As stores reopened for business after the war their windows were old fashioned and empty of goods. American display remained strong but uninspired. It was not until the 1960s, when display again became subject matter for artists such as Claes Oldenburg, Roy Lichtenstein, and Andy Warhol-particularly the bright spaces of food supermarkets-that creativity was revived. Warhol, who had begun his career in display, would combine the two when he introduced his pop paintings into windows commissioned by Bonwit Teller. American department stores would carry the creative banner of window display through much of the late twentieth century, working with artists such as Jasper Johns and Robert Rauschenberg. 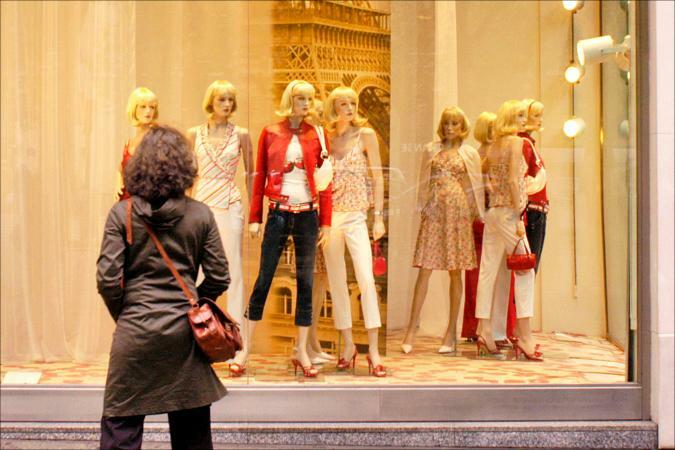 Although some large stores continue to have display departments, shop windows across the world have been given over to the homogenous visual merchandising campaigns of the big brand names, often containing only tailor's dummies and photographic backdrops. It is the designer boutique that is pioneering truly creative work in the beginning of the twenty-first century. Shops such Prada and Comme des Garçons prove that the window display can still offer enough beauty, theatre, and spectacle to halt a passerby. See also Department Store; Mannequins; Shopping. Adburgham, Alison. Shops and Shopping, 1800-1914. London: Allen and Unwin, 1964. Honeycombe, Gordon Selfridge. Seventy-five Years: The Story of the Store, 1909-1984. London: Gordon Park Lane Press, 1984. Kiesler, Frederick. Contemporary Art Applied to the Store and Its Display. London: Pitman and Sons, 1930. Leach, William. Land of Desire. New York: Pantheon Books, 1993. Marcus, Leonard S. The American Store Window. New York: Whitney Library of Design, 1978. Walsh, Claire. "Shop Design and the Display of Goods in Eighteenth-Century London." Journal of Design History 8, no. 3 (1995): 157-176. Ward, Janet. Weimar Surfaces: Urban Visual Culture in 1920s Germany. Berkeley: University of California Press, 2001.